There are a lot of ways to support local artists. Three good ways are: buying from local artists, word-of-mouth advertising via your family and friends, and attending local art fairs, open studios events, and receptions. But what if you are an artist? We all love to support artists by buying handmade, however our wallets don't allow us to give as much support as we'd like. What else can artists do to support artists? A gallery in Groton, MA has come up with a great way for artists to support artists. 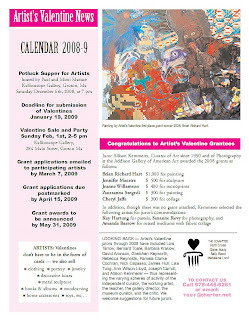 It is the Artist's Valentine Sale, held each February at the Kalliroscope Gallery in Groton Center. All the proceeds from the sale go towards grants made to artists. I have attended this event as a buyer for the last few years, and I can tell you it is well done. The gallery is in an old church, so the environment is great. There are many cards, which are refreshed as the afternoon goes on. And it is not just cards, either - there is mixed media art, jewelry, and more! Plus there is music, appetizers and drinks. Grants are distributed based on merit. To be eligible for one of their grants, you need to donate to their Valentine sale. The donation deadline for this year is January 16, 2009. The images above and below include all the details. So get out and peruse some lovely handmade valentines on Sunday, February 1st from 2-5PM! I love this idea! I grew up near Groton, so I'd love to attend and bring my Mom, too!